In ancient times the variety show was called “one hundred entertainments,” including Combining fighting, performance and physical exercise, wushu is a traditional sport practised in different styles and on set patterns, either with or without weapons. It flourished in the various dynasties during the past millennium and embarked on a new stage of development in the early fifties of this century. An ensemble of clay figurines in the Western Han Dyansty (206BC-AD25) showing acrobatic performances accompanied by a musical band. Excavated in 1969 in Jinan, Shangdong Province. 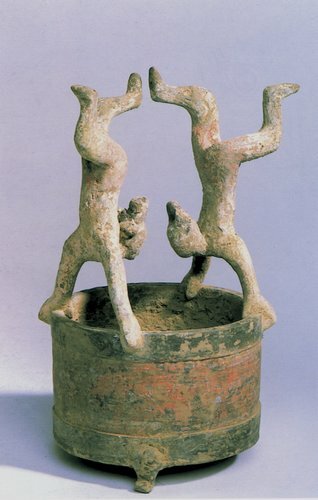 Porcelain figurines in a double-decker handstand, dating back to the Eastern Han Dynasty (25-220) and excavated in 1972 in Louyang, Henan Province. 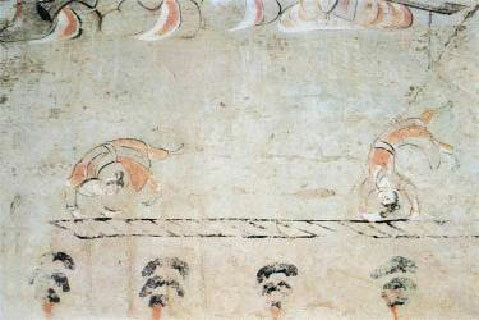 A mural excavated in 1977 in Jiuquan, Gansu Province, showing acrobats in handstand and roll, dating back to the Wei-Jin Dynasty (220-420), showing acrobats in handstand and roll. 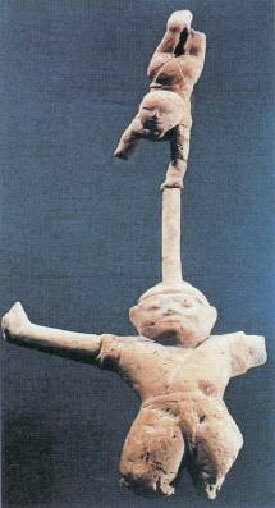 A wooden figurine showing a handstand on a pole on the balance's head, dating back to the Tang Dynasty (618-907) and excavated in 1960 in Turpan, Xinjiang. 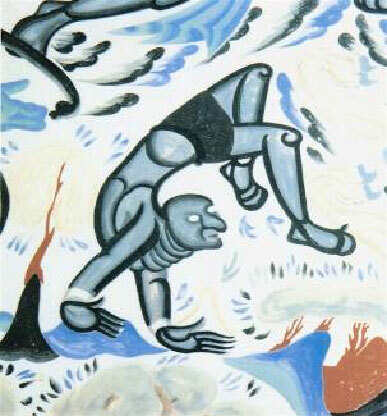 A handstand in a mural in Mogao Grotto No. 249, Dunhuang, Guansu Province, built during the Western Wei Dynasty(535-556) .